Welcome to Simple MP3 Player! The new Design has buttons that look exactly like a Mini MP3 Player: Play, Pause, rewind and fast-forward. In addition, you can adjust the volume and the exact spot in the song or one of your MP3 audiobooks, with the help of a scroll bar quite quickly! The Player shows the title of the audio track being played and shows you your playlist. You can add new files at any time, while our MP3 Player Software not only supports MP3, but also wav, AIFF, caf, mp4, mp2, mp1, aac, au, m4r and the m4a Format. Drag & Drop your audio files into the App, select a game mode (in the series, loop, or Shuffle) and click Play! That’s how easy it is! 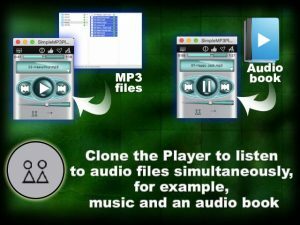 Our Simple MP3 Player also creates something that the best MP3 Player you have ever held in your Hand would not succeed: you can clone our Player and create a whole new playlist for the Player # 2. You can use two Players either separately or together. For example, you can play your MP3 music on Player # 1, and your audio notes on Player # 2. Hello, and welcome to Simple MP3 Player! This App helps you to play your own MP3 files on the Computer and is very user-friendly! Just Drag & Drop your Mp3 files into the Player. And again. If you want to delete the files that we loaded before, and only keep them here, then press “Set Files”. Otherwise, if you want to add these files to those of earlier, press “Add Files”. Now you can choose between 3 game modes: Sequential, or play the files in the order in which they were recorded, Loop/loop, or Schuffle/mixed. The buttons of this App are like those of a real MP3 Player: Play, Pause, fast forward, rewind. Now press Play. If you are searching for a certain location in the file, you can use this scroll bar to find it more quickly. You can also clone this Player and then load other MP3 files on it. Now you can use either the first or the second Player, or both at once!